If you are organizing a Clarinet Quartet, this is the best place to start to get any kind of sheet music for the group. Here you'll find the Top Three Original Clarinet Quartets of all time; loads of arrangements from classical, jazz, and Klezmer styles to movies themes; and places to find legal, free clarinet quartet sheet music. If you are thinking of organizing a Clarinet Quartet, make sure you leave this Clarinet Quartet Sheet Music page and read this guide, Absolutely Free! Let's start with discussing different instrumentation you will find in your search for clarinet quartet sheet music. Do not get too down in the dumps if you don’t have or know people who play “the exotics” – meaning Eb soprano, Eb alto clarinet, or Bb bass clarinet. It is perfectly fine to start playing with four Bb soprano clarinets, just make sure you print and/or order music for four Bb soprano parts or 3 Bb sopranos with Bb bass clarinet. The fourth player can easily play the bass part on soprano. It will not sound as dark and deep as an ensemble, but the most important thing to do is get together. Like I said, there is not a lot of original clarinet quartet literature out there. But, these are the top three works composed specifically for the ensemble. Why is this important? These composers wrote for the clarinet. These are not transcriptions with awkward jumps or impossible licks meant for a non-clarinet ensemble. These tunes are not easy, but they should be on the top of your list of collecting clarinet quartet sheet music. Paul Harvey's Quartet (3 Bb and Bass) - Probably the number one, original clarinet quartet. One of my favorites of all time. Paul has a great way of writing for the clarinet and making this ensemble sound rich and deep. Notice from movement to movement, he uses the last motive of one movement to start the motive of the next movement. Genius! This piece is easy on the ears for nearly any audience. Four three soprano clarinets and bass clarinet. look inside Quartet Composed by Paul Harvey. For Clarinet Ensemble. Schott. Playing score. 52 pages. Schott Music #ED11072. Published by Schott Music (HL.49002641). Alfred Uhl's Divertimento for clarinet quartet (3 Bbs and Bass) - Modern sounding but palatable for the audience. This work is challenging to put together but well worth the effort. look inside Divertimento (Set of Parts). Composed by Alfred Uhl (1909-1992). For Clarinet Ensemble. Schott. Set of Parts. 30 pages. Schott Music #ED4437. Published by Schott Music (HL.49004886). James Waterson's Grand Quartet (Four Bb soprano clarinets) – Very challenging and composed in a classical style. Each part has technical passages to learn. This piece is written for four Bb soprano clarinets, but I have played it many times with a bass clarinetist on the fourth part. look inside Grand Quartet (Clarinet Quartet). Composed by James Waterson. Arranged by Andraud, Albert and Albert Andraud. For Clarinet Quartet, Woodwinds (FULL SCORE ONLY). Woodwind Solos & Ensembles - B-Flat Clarinet Quartet. Southern Music. Grade 5. Southern Music Company #SS285SC. Published by Southern Music Company (HL.3773912). Below is a short list of fun tunes or books to collect. For Digital Download --- Musicnotes.com has Classical, Jazz, Patriotic, Hymns, and Christmas Carols. More than 280 selections for as low as a few bucks each. Clarinet Candy by Leroy Anderson This piece also has a separate band accompaniment to feature your quartet. Allegro for Clarinet Quartet, By Gilles Arcens Do you like videogame music? This sounds like it. Click on the soundfile once you visit the site. Klezmer Clarinet Quartets more than ten to pick from here. The Nutcracker Suite By Peter Ilyich Tchaikovsky Perfect for the holiday season and includes these movements: Overture Miniature; Arabian Dance; Dance of the Sugar Plum Fairies; Trepak; Waltz of the Flowers. Christmas, Hanukah. Duration 15:30. Brubeck Blue Rondo a la Turk Clarinet By Dave Brubeck – THE COOLEST TUNE ON THIS WHOLE LIST!!! Clarinet Marmalade By Edwin "Daddy" Edwards, D. James "Nick" Larocca, Tony Sbarbaro, Larry Shields Originally written and performed by members of the Original Dixieland Jazz Band of New Orleans in 1917, this rousing tune puts capable clarinetists through the paces in fun-loving Dixieland style. Predictably, accented upbeats and syncopations abound from start to finish. Duration 2:40. - promoting organization of clarinet quartets especially with a number of free classical and jazz arrangements. 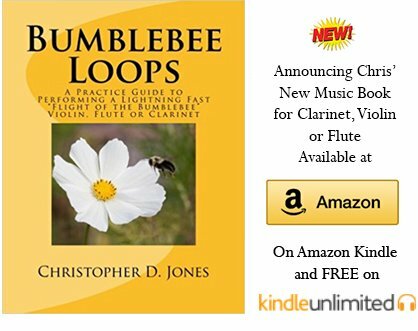 Free-scores.com for many more free Clarinet Quartet Sheet Music arrangements.